If you are working in an organization or a company and that field is not paying you your outstanding balance then you have to write a Letter Requesting Payment Outstanding Balance. This letter should make remind to employers that your balance is still pending and make actions as soon as possible. They might not have remembered about your open balance for a program or they don’t know the process of paying. So the solution to get the payment is made payment plans clear to them. so writing some wonderful words to them will make your world. An effective email will outline the points that you want to cover or express. You can even tell how they can pay and by what. 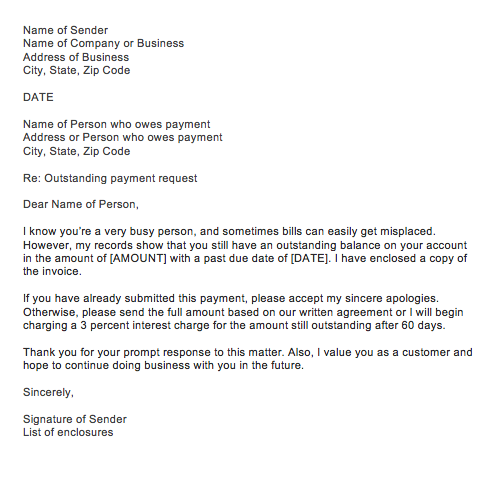 GIVE SPECIFIC DETAILS: make sure that your outstanding payment reminder letter format includes an invoice or details regarding your work. Mention your work or services properly according to your position, so that client can see the benefit in return of paying you. KEEP SENSIBLE TONE: while writing your letter don’t get harsh with your words or lose your temper for not getting your money. Many times people forget even their own bill. So talk respectively and calmly instead of attacking verbally. DON’T PROVIDE YOUR SERVICES: if you think that employer has failed to pay your bills for very long time and you feel that they will not pay then you can stop providing your services depending on your choice till your bill is not paid. You need to convey this to your employer in a professional and polite manner but be direct. SOMETIMES FORCE IS NOT NECESSARY: there can be many circumstances that will stop you from getting your payments like urgent marriage, medical emergency, or any death case. To know the approach is just to contact your customer and if they are not providing you full payment ask them to pay to complete your expenses at least. SOME ADDITIONAL TIPS: keep your letter professional, keep it short, to the point, state your consequences of not paying, thanks to them for cooperation. Write your letter in proper formal format by mentioning the sender’s and the receiver’s name and complete address along with the date. 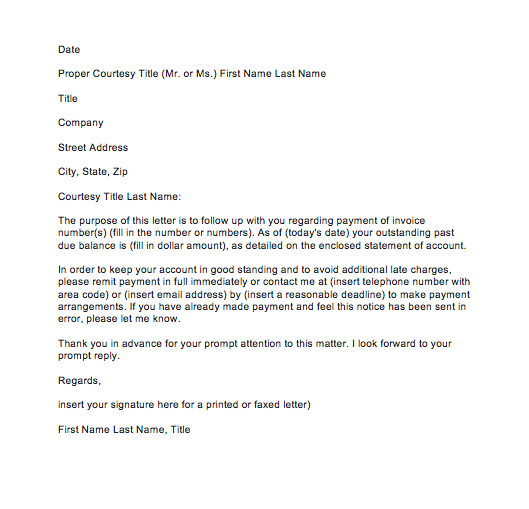 You can write the subject and then salutation in your letter. After that in the end, thanks them for cooperation and with regards write your name and sign. Many people find it challenging to receive payments on time. If one doesn’t respond to the first letter then you can send the second letter. For more details, you can download the samples and examples for your letter’s layout and ideas and can make it according to your choice.